Click this link or any other link to the iTunes app store. Click "App Store" in the breadcrumbs trail. You can also access this directly from the store front page. The key thing is you don't don't need to updated iTunes to browse the store. They all work, they all take you to the same place, so which is best to use? Let's run through a few different situations. Displaying a website address in print may include business cards, newspaper advertisements, magazines or flyers. The key to links in is to keep the address as short as possible so it's quick and easy to type. If you're going to be doing a lot of print advertising, having a short domain to start with will make life much easier. If you've got a long address, consider buying a short one as well that can redirect to your proper address. For print work don't include the http:// part. People just don't need to type it, and it may confuse. If you want to send people to a secure page ie. https://, or an FTP site, ie. ftp:// you're probably better to create a separate webpage as an intermediate step, or simply redirect users to the secure page. What about the www bit? The main benefit of the www is it makes it obvious that the text is a domain name. If you're using a .com, that might be obvious enough so you can leave the www off. All sites should work with and without the www bit, but some don't, so check your site does first. Ask your web developer to set up both if needed. Ideally one version will redirect to the other version. Some domain names are unusual enough to really need the www, for example bla.st. By writing as www.bla.st it makes it more obvious the text is a web address. Interestingly we've found even if you don't include the www in your print work, many users will type it anyway. Generally we include the www, as people expect it, and it makes things obvious. For both television and radio it's even more critical to have a short, and memorable website address. If you're running a tv or radio campaign and you already have a long website address, it may be worth buying a short domain specifically for the campaign. Domain names are only $10-30/year and can simply redirect to your proper website address. The reason is simple, by including the http:// these applications will automatically turn the link into a clickable link. Some applications are smart enough to see a .com and turn that into a link, but to play it safe include the full thing. What about http://wordjot.com without the end slash? While it will work fine, your web server will need to redirect the user to the full address http://wordjot.com/, so to save a tiny amount of work on your server include it in the first place. Also be careful how long your URL is, it must not wrap onto the next line at all. See below for more details. You don't need to display the http:// to the user, but the HTML link requires it to work. The www bit is optional, and can be left off to keep things short. It's well worth mentioning that the first part of a URL, ie. the domain name, is not case sensitive, while the second part however may or may not be, depending on the web server. If you're uploading files to a web server, we recommend keeping everything in lower case to make life simple. When writing URLs be careful to keep them as given. TinyURL is just one such service, and there are a number of others. Shortening long addresses is essential for sending in email applications. If your address wraps onto the next line, often the automatic link generation may not work, splitting the address in two, and only linking to the first line. Keep things as short as possible, and use the write format in the right situation. Generally offline use the format www.wordjot.com, and online use http://www.wordjot.com/. Hope that helps, leave any questions or comments below. For years I used Freehand to manually produce invoices. They looked great, but they were tedious to edit. Freehand was certainly no spreadsheet software so sums and GST were calculated manually which was tedious and made invoicing a real chore. Because Freehand made individual files it was hard to search through them, and they had to be organised and named carefully. Also tricky was keeping track of which invoices were outstanding and which had been paid. Blinksale and Xero are two web based applications worth considering if you want to make life a lot easier for yourself. Blinksale is a simple invoicing system. That's all it does, unlike Xero which is a more complete accounting system. For a developer, designer, artist, photographer or anyone who doesn't send out a huge number of invoices per day Blinksale is an excellent, easy to set up, and cheap solution. Blinksale's 50 invoices per month plan costs only USD $12/month (about $16NZD/month) and there are other plans available including a free 3 invoices/month trial. Deisgn options aren't hugely advanced, you can upload your logo and choose from one of the basic templates. If you're a web developer you can also edit your own stylesheet. Quite frankly I don't think it matters what invoices look like, as long as they are professional and easy to read. Invoices are sent via email, removing the need to print out invoices and post them manually. Most businesses I've dealt with haven't had any problems with this system. It certainly saves trees and money on postage. There are two great features about Blinksale that I really love. The first is how quick it is to create an invoice. The first time you invoice a client you'll need to load in their address and details, but after that it's a matter of clicking "New Invoice", selecting your client, and deciding what to charge them. You can set a default hourly rate so just enter how long you've spent on something, what it is, and everything else is calculated for you. Making invoices now is actually fun, rather than a chore. The second feature that really makes things easy is having a quick overview of your invoices including outstanding invoices. Totals are displayed so you can see how much your clients owe. Because it's all database driven it's easy to display invoices for a particular client, or only outstanding invoices so you can send a reminder. Being in New Zealand isn't a problem, it's easy to set up GST at 12.5%, and this is all calculated automatically on any invoice. If you're invoicing an overseas client, you can turn off GST for that invoice. 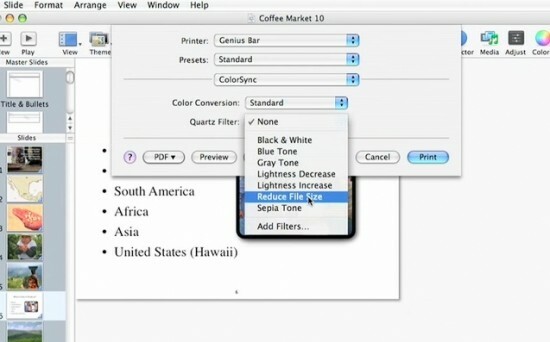 With the more advanced Blinksale plans it's possible to send invoices as PDF files, however if you're on a mac you can use the built in "Save as PDF" feature of the print dialogue box to make a PDF file no matter what plan you have. Another interesting feature of Blinksale is the ability to send recurring invoices, for example, I have clients I invoice annually for their domain names and website hosting. Xero is a new web application developed here in New Zealand. I haven't used it yet, but overall it looks very smart and easy to use. 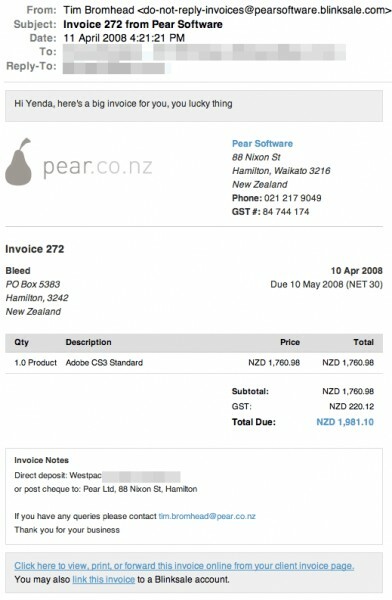 Xero costs NZD $49/month but it really is a more complete accounting system. Personally I use Blinksale and a spreadsheet cashbook in Excel as my accounting system, and this is sufficient at the moment. As business grows I'll consider moving to Xero to automate even more than just invoices. There are some disadvantages of using an online invoicing system. If you don't have broadband or a reliable internet connection, using an online service probably isn't a good idea. You have to be on the internet to send or find invoices, so be aware of this if you need to make invoices while mobile. It's also a good idea to forward invoices to yourself or print them out as a backup. Download this zip file below. Inside this zip file is a special transparent image which will be used as your desktop picture. Open up System Preferences, and go to the "Desktop & Screen" saver section. Make sure the "Desktop" tab is selected. 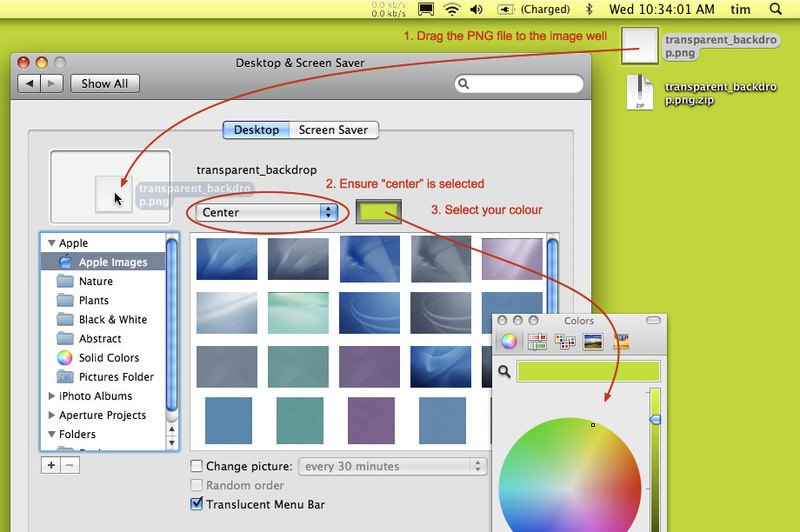 Ensure that "Center" is chosen from the pop up menu, and a button to select your background colour will appear. Choose what ever colour you want. Perhaps not bright lime. Inbox infinity is a little email management system I've developed over the past few years that hopefully others will find useful. It's the complete opposite of the Inbox Zero philosophy by Merlin Mann of 43 folders. Inbox infinity is remarkably similar to the concepts behind Google Mail, where search is the interface, so for this system to work you'll need an email client with a decent search facility, such as Apple Mail. Read everything that comes in. If the email is something you need to act on, flag it. That's it, the ultimate in lazy. Doing nothing becomes the most commonly done thing, and that makes life easier. "Do nothing" FTW. The problem with folders and keeping things organised is you have to make a decision for each email you receive. With Inbox Infinity decision making is greatly simplified. "Flag stuff I need, ignore stuff I don't". To flag things easily, try adding the flag button on the toolbar. Right click the toolbar and choose "customize". To keep track of what's been flagged, it's easy in Apple Mail to set up a smart folder to show only flagged items. You can then use the flagged items a bit like a todo list, of stuff you have to deal with. To find stuff from a certain person, or an old email use the search facility. Currently with over 42,344 email messages Apple Mail searches through everything in about 1 second. I have to be honest, I do sort my mail into folders. Once a year it's worth creating a folder for the year just past, and archive your inbox into it. This stops the inbox from becoming too much of a behemoth. Note Jaguar and Panther versions of Mail don't handle folders bigger than 1GB very well, Tiger 2GB, so you might like to archive each month if you get a lot of attachments. You could also use the "Remove Attachments" command from the message menu. Well that's Inbox Infinity - quite frankly the system is pretty flawless at the moment, specific messages can always be found, and you know what you've got to do. How much more organised do you need to be? Well the MacBook Air is an interesting release from Apple. Somehow they managed to remove a huge number of features from the MacBook, make it a bit slimmer, and then have audacity to charge people more for it. "Pay more, get less" could be their motto for this one. 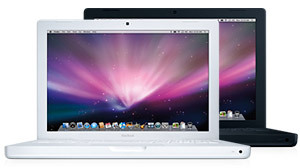 Here in New Zealand, the cheapest new mac laptop you can buy is the MacBook at $1848 NZD. Cheap PC notebooks on the other hand are available around $799 NZD, well less than half the price. For a huge number of people, especially for those non tech savvy users who just want to be able to save pics from their digital cameras, and use the internet, it's just not worth spending the extra money on a mac. If Apple really wanted a major hit, they should have released a MacBook air that was $700 USD cheaper than the MacBook, rather $700 USD more expensive. The tech specs could stay about the same too. This tip of the week from Apple demonstrates how to use OS X's built in save for PDF feature, but while reducing the resolution and thus file size of images. 3) From the "Quartz Filter" menu, choose "Reduce file size"
Apagoinc also make a commercial utility called PDF Shrink that shrinks existing PDF files, and gives lots of options. We've just set up a new website that lets anyone browse StumbleUpon with Safari, the iPhone or iTouch, or any other browser. Currently the official StumbleUpon toolbar only supports FireFox or Internet Explorer. For anyone who hasn't used StumbleUpon, it's a great way to discover websites that may be of interest to you.